BUT LIKE, street tacos. Street steak tacos. Steak street tacos. You on board? In all my years of food blogging, this might be one of those times where I genuinely wish I could e-funnel just a tiny slice into your gaping-open mouth via some magical loophole in monitor portals. Because THIS PIZZA. I have no idea how it happened. But it happened. And you’re probably like, “That steak looks overdone, Bev.” Listen, it’s perfect. But I’ll get to that. 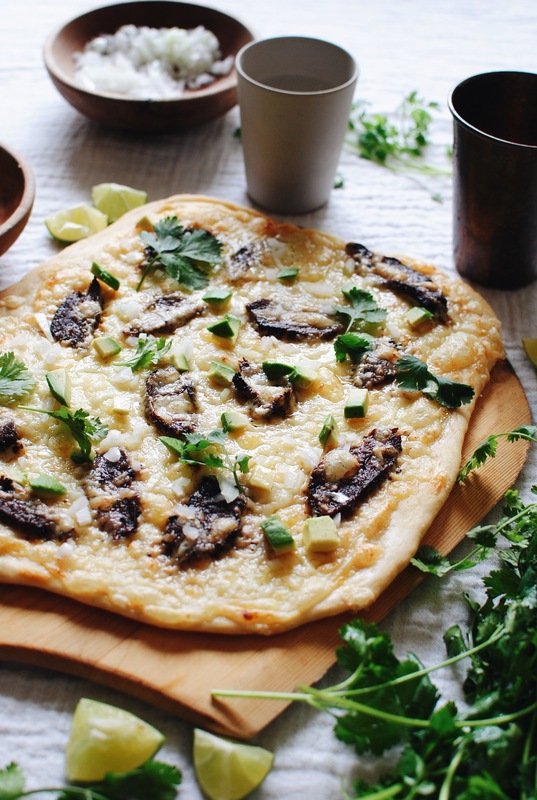 And you’re probably like, “Raw white onion makes me a hurl fountain.” Listen, it won’t. But I’ll get to that. It’s fairly simple when it’s all said and done, but you can totally take short cuts if you want. 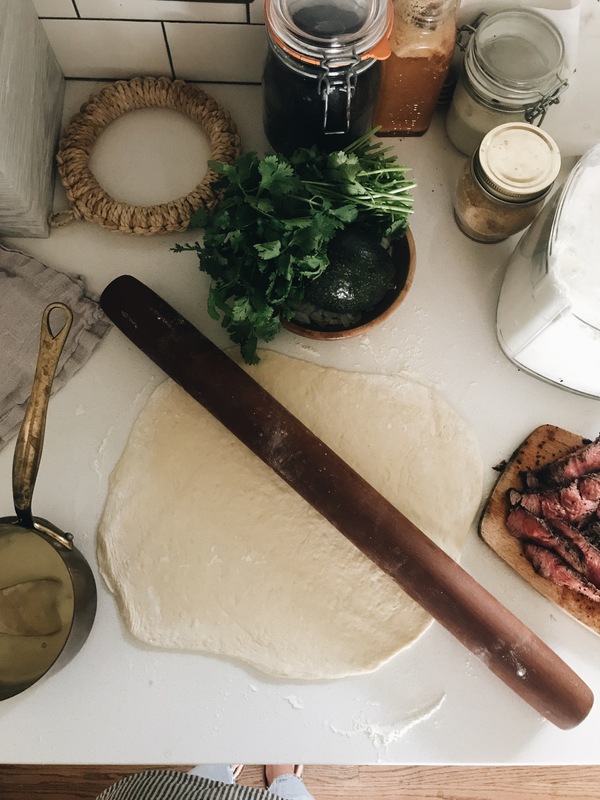 The majority of the legwork is up front, with the dough making, the steak marinating, the roasted garlic sauce making, the searing, then the assembling. WHICH OKAY, IT SOUNDS like a lot of work, but it ain’t bad, y’all. This is why wine exists. I felt that mental fist bump. 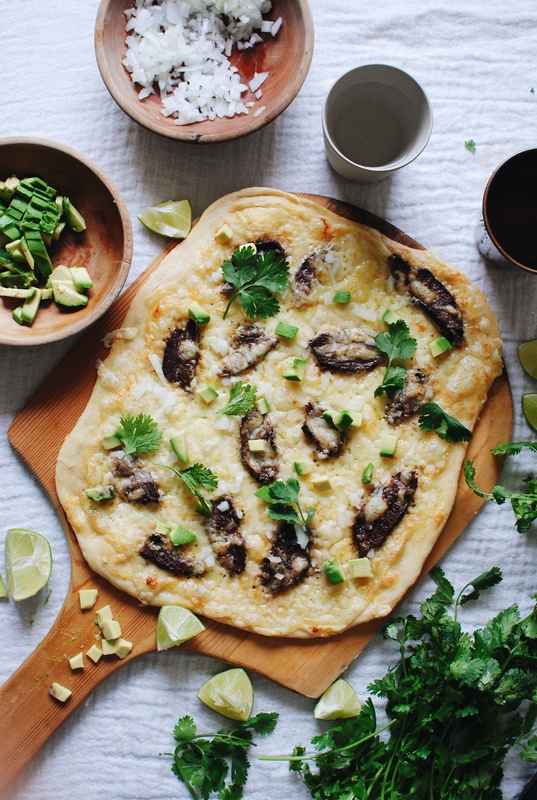 If you’ve not tried this pizza dough recipe yet, DEW EET. It’s easyeasyeasy, and tastes ridiculous. So once you’ve roasted your garlic, you’ll squeeze the cloves into a food processor and add about 1/3 cup of milk and a pinch of salt. WHIZZZZZ until it’s all smoothy smooth. If you need to thicken it, throw it in a tiny sauce pot for a second. Otherwise, go ahead and brush it over your pizza dough! You like where this is headed, don’t you? Also, I don’t know why I’m showing you a blank pizza crust. POLL:::::: when the pizza dough has been rolled out, but not yet baked, do you call this pizza dough? Or pizza crust? Like the above? Not yet baked, so is it a crust? But it’s rolled out, so is it a dough? Roasted garlic sauce, seared and sliced steak, aged white cheddar. You know, the good things in life. Also! You’ll notice I seared the steak about medium rare, knowing it would cook more in the baking. And you might think, that’s going to overcook, dude. It really doesn’t! 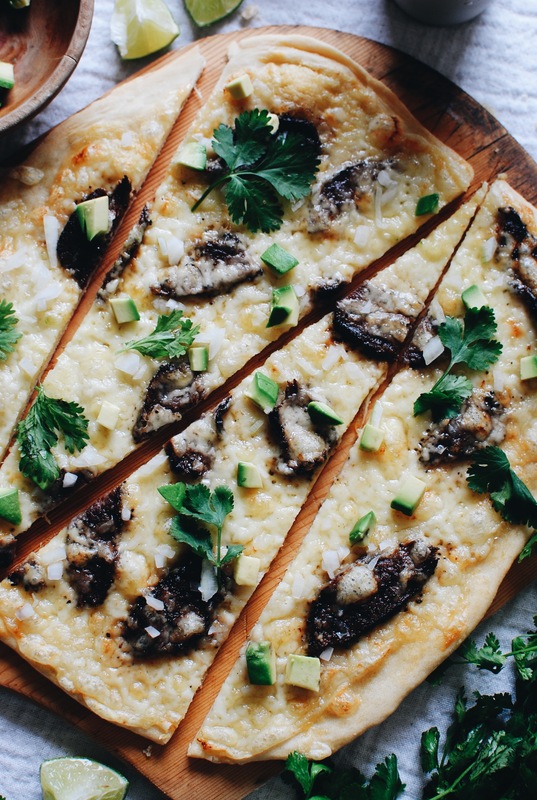 Once sliced super thin, and blanketed under that cheese, it just melts into the pizza. I’m telling you, you’ll cry for a month. Once out of the oven, garnish up, street taco style! Diced white onion, cilantro leaves and tiny cubes of avocado. I know the avocado’s not 100% authentic, but my raging soul fairies within governed that move, so take it up with them. Uggggh, the sauce with that white cheddar? Insane. The steak with that yeasty pizza crust? Ridic. And you know what, load it up with more steak if you want! MORE ONION IF YOU CAN HANDLE IT. Lastly, squirt some lime juice over that whole mess and watch your life become something you never thought it could. Isn’t there some game on this weekend that you need to watch while eating this? I’m pretty sure there is. Poke the steak on both sides with a fork, then place in a large plastic bag. Add the marinade ingredients, seal and rub the coating all over the steak, making sure it’s covered. Marinate in the fridge for as long as you want. In a small bowl, pour the yeast and sugar over the warm water. Let it sit until the yeast is bubbly and foamy, about 10 minutes. In a large bowl, combine the flour and salt. Pour the yeast water into the flour and stir to mix. Turn onto a lightly floured work surface and knead a few times, until it becomes a ball of sticky dough. Place back in a cleaned bowl, cover and let rise for about 3 hours. Punch it down, knead a few more times (it will be much smoother and more elastic by now), and let it rise again for another 2 to 3 hours. Divide dough into two or three mounds. Cover with a kitchen towel until you’re ready to roll out and top. In the meantime, place the two garlic heads in a small piece of aluminum foil. Drizzle with the oil and a pinch of salt. Roast in a 400 degree oven for 45 minutes. Leave the oven at 400 for your pizza baking. Once the garlic cloves are cool enough to handle, squeeze them into a food processor. Add the milk and a pinch of salt; whizz until smooth and saucy. If you want, you can transfer the sauce to a small pan to keep warm and thickened. If it’s thick enough, let it sit. Heat a large skillet over medium heat, and remove the steak from the plastic bag. Pat as dry as you can. Sear the steak on both sides, until you get good charring all over, about 5 minutes per side. Let rest for a few minutes, then thinly slice. 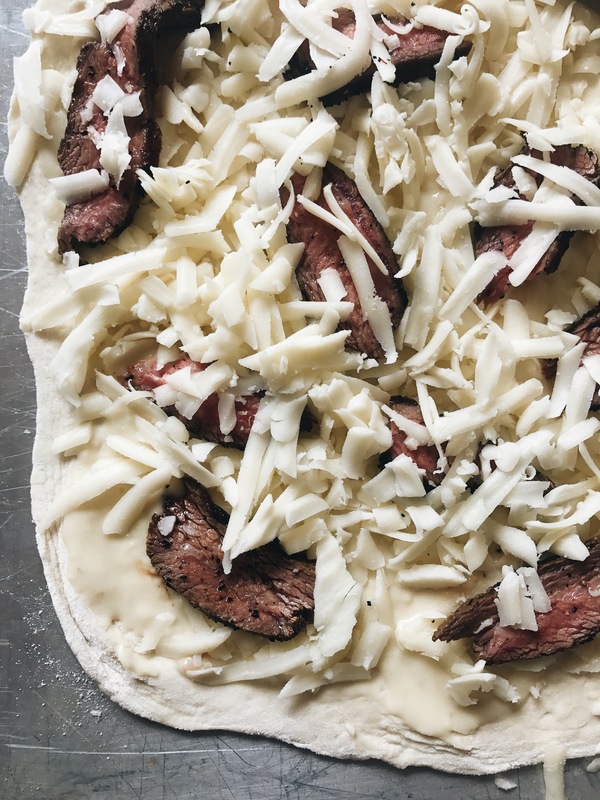 While the steak rests, roll out each of your dough mounds to your desired pizza size. 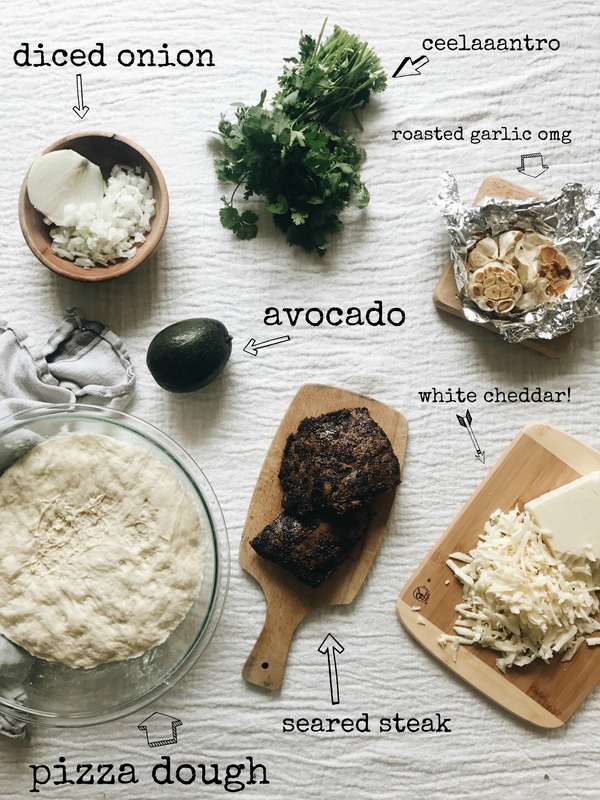 Brush the roasted garlic sauce over each circle, then layer with a bit of sliced steak, and the cheddar cheese. 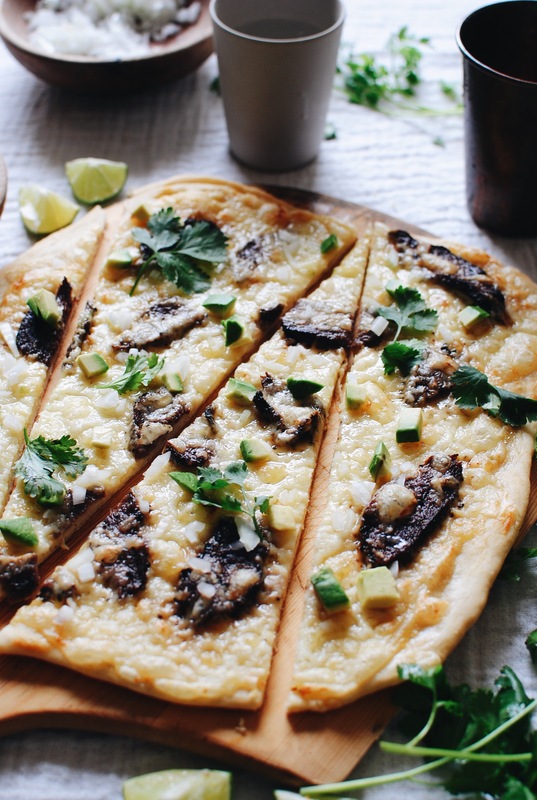 Bake each pizza for about 20 minutes, or until the cheese is starting to brown and bubble. 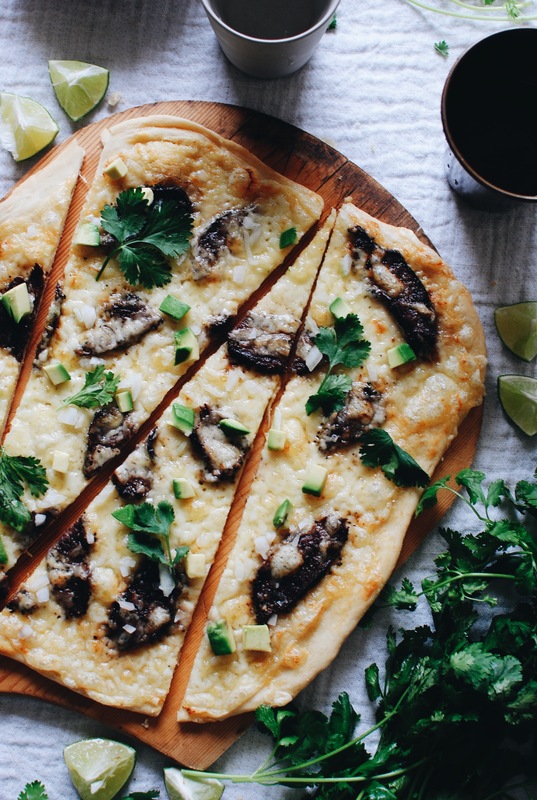 Garnish each pizza with diced white onion, cilantro leaves and cubed avocado. Garnish with fresh lime juice and shove it in your face as fast as you can. If you’re not emotionally abused after eating this, what are we even doing here? Uau! Pizza boa essa, bem diferente para mim mas parece bem gostosa de comer. Looks delish! My husband might ask me to marry him again if this is on the menu soon. :) Thanks for sharing this one!